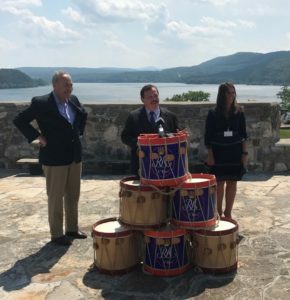 In August, Envision client, Fort Ticonderoga, welcomed the Senate Minority Leader Chuck Schumer to visit the Fort and speak on the historical importance of the site and its plans for the future. In addition to his pledge to support Fort Ticonderoga’s efforts to secure public support on the Federal level, Senator Schumer was also enthused to learn about the Fort’s plan to expand its collection and continue to drive economic development in the North Country of New York State. See the local news report here.